Our position on the ingestion of essential oils is that all of our oils are undiluted, pure and natural and suitable for therapeutic purposes. We do NOT recommend the ingestion of essential oils as they are highly concentrated and can cause damage internally if administered without expertise. This is also the position of the International Federation of Aromatherapists. Unless otherwise stated, never use essential oils on your skin without diluting the essential oil with carrier oil. A skin test is recommended prior to use. Place a small amount of the blended oil on the inside of your elbow, cover with a bandage and check in 24 hours. If you experience any soreness, redness or irritation do not use the blend. Consulting an Aromatherapist to obtain assistance to determine what essential oil you should use is recommended. Do not use essential oils if pregnant, nursing, diabetic if noted on the essential oil page or blend page. Consult your physician and other reference guides for complete information. Essential oils do not necessarily have the same healing properties of the plant it comes from. Herbal products sometimes contain different chemical constituents than the essential oil derived from the same plant. Therapeutic results may be experienced when using an herbal product from that of a blended essential oil. Do not use more than 2 drops of the following essential oils when used in a bath: Black pepper, Juniper, Camphor (rectified), Peppermint, Citronella, Sage, Clove, Spearmint, Eucalyptus Globus, Thyme, Ginger. The following essential oils should be avoided during pregnancy: Basil, Marjoram, Cedarwood, Myrrh, Clary Sage, Rose, Fennel, Rosemary, Jasmine, Lavender, and Thyme. The following essential oils should be avoided if you have epilepsy: Cajeput, Fennel, Camphor, Hyssop, Peppermint, Eucalyptus, Rosemary. 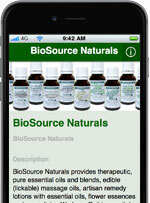 Customers may purchase products from BioSource Naturals, LLC only with the clear understanding that all products must be used at their own discretion and only after referring to the Safety Data Sheets (SDS) and all other relevant technical information specific to the product. For further information, we recommend the following reference books. You may also read our article A Beginner’s Guide to Using Essential Oils.